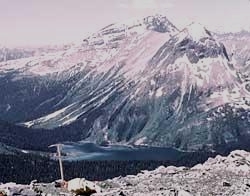 Named for: The pass likely takes its name from the Burstall Lakes. Lt. General Sir E.H. Burstall was the Commander of Canadian troops during WW I. The high country in the vicinity of this pass provides an excellent view of Mount Sir Douglas to the south.